CHINESE: Lai pu tao, Jin li zhi, Ku gua ye, Ku gua, Liang gua. FRENCH: Margose, Margose amère, Momordique amère, Concombre amer, Concombre africain. HINDI: Karela, Kerela, Tita kerala. 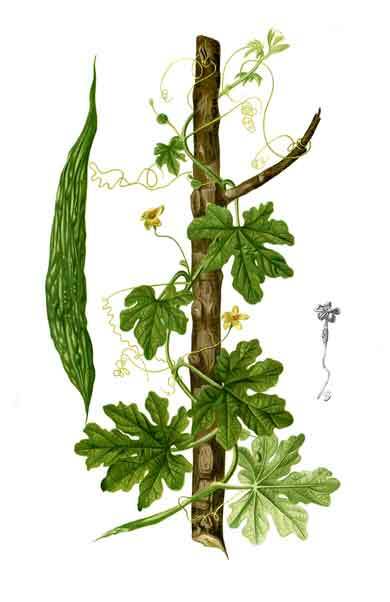 ITALIAN: Pomo meraviglia, Momordica amara. LAOTIAN: Bai maha, Haix, S'aix. SINHALESE: Karavila, Karawila, Pakal, Pavakai. 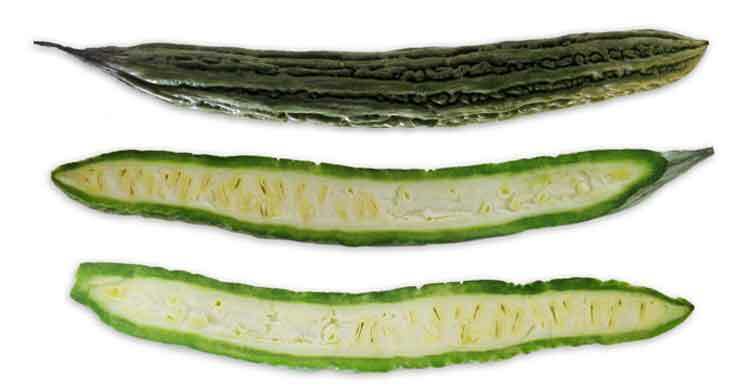 SPANISH: Amargoso, Bálsamo, Calabaza africana, Cundeamor, Momordica amarga, Pepino amargo. 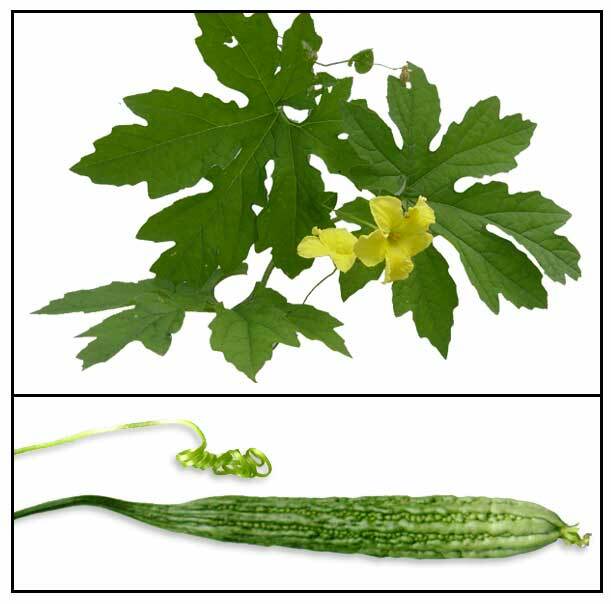 Ampalaya is a climbing vine, nearly or quite smooth, annual vine. Tendrils are simple, up to 20 centimeters long. Leaves are 2.5 to 10 centimeters in diameter, cut nearly to the base into 5 to 7 lobes, oblong-ovate, variously toothed, and heart-shaped at the base. Male flower is about 12 millimeters long, and is peduncled, with a rounded, green, and about 1 centimeter long bract approximately at the middle. Female flower is yellow flower, about 15 millimeters long, long-stalked with pair of small leaflike bracts at middle or toward base of stalk. Fruit, in cultivated form, is green, fleshy, oblong, cylindric, 15 to 25 centimeters long, pointed at both ends, ribbed and wrinkled, bursting when mature to release seeds; in wild forms, ovoid, about 2 to 4 centimeters long. Seeds are oblong, compressed 10 to 13 millimeters long, and corrugated on the margins. - Year-round vegetable, extensively cultivated in the Philippines for its bitter edible fruit. - Probably of Asiatic origin. - Phytochemical study yielded alkaloids, glycosides, aglycone, tannin, sterol, phenol and protein. - 1898 study reported a bitter alkaloid and a glucoside. - Leaves and fruit yielded a bitter principle, momordicin. - A petroleum ether extractive yielded a highly aromatic ethereal oil, a fixed oil, traces of free fatty acids and carotene. - Ethyl ether fraction yielded chlorophyll, a glucoside-like substance and resin. - Water soluble extractive yielded a saponin-like substance and mucilaginous bodies. - Proximate and mineral composition of fruit yielded moisture 93.20%, ash 7.36%, lipids 6.11%, fiber 13.60%, protein 27.88 6.11%, carbohydrate 34.31%, energy 241.66 kcal/100 g, magnesium 0, sodium 2.40 mg/100g, potassium 171.00 mg/100g, iron 1.8 mg/100g, zinc 0, manganese 0.08 mg/100g, copper 0.19 mg/100g, phosphorus 70 mg/100g, vitamin C 96 mg/100g. - Considered astringent, antidiabetic, abortifacient, antirheumatic, contraceptive, galactagogue, parasiticide, anthelmintic, purgative, emetic, antipyretic, febrifuge, emmenagogue, cooling , tonic, vulnerary. - Fruit considered tonic and stomachic. - Studies have shown antidiabetic, adaptogenic, anti-inflammatory, membrane stabilizing, antioxidant, cholinomimetic, analgesic, antimicrobial, gastroprotective, hepatoprotective, anti-dengue, antifungal properties. - Both wild and cultivated forms are edible. - Fruit of wild form usually roasted over fire and eaten with salt or "heko." - The leaves and fruit - used as vegetables - are excellent sources of Vit B, iron, calcium, and phosphorus. It has twice the amount of beta carotene in broccoli and twice the calcium content of spinach. Characteristically bitter-tasting, slight soaking in salty water before cooking removes some of the bitter taste of the fruit. - In India, fruit eaten in curries. - In the Philippines, juice expressed from the green fruit is given for chronic colitis: also used for bacillary dysentery. - Astringent powdered leaves or root decoction can be applied to hemorrhoids. - Leaf juice for cough and as a purgative and anthelminthic to expel intestinal parasites, and for healing wounds. - Seeds also used to expel worms. - The vine or the juice of leaves used as mild purgative for children. - In large doses, the fresh juice is a drastic purgative. - Decoction of roots and seeds used for urethral discharges. - Juice of leaves used for chronic coughs. - Leaves and shoots used as vulnerary. - Sap of leaves used as parasiticide. - Fruit macerated in oil used as vulnerary. - Fruit considered tonic and stomachic; used in rheumatism, gout, and diseases of the spleen and liver. - Pounded leaves used for scalds. - Infusion of leaves or leaf juice used for fevers. - Used for chronic stomach ulcers. - Root sometimes used as ingredient in aphrodisiac preparations. - Decoction of root used as abortifacient. - Fruit in large doses considered a drastic purgative and abortifacient. - In India, root used as astringent; applied externally to hemorrhoids. - In Lagos, decoction of leaves used as stomachic. - Leaves used as anthelmintic and antipyretic, and applied externally to leprosy. - In India and Malaya, pounded leaves are applied to skin diseases, burns and scalds. - Poultice of leaves used for headaches. - Infusion of flowers used for asthma. - Olive or almond oil infusion of the fruit, without the seeds, used for chapped hands, hemorrhoids, and burns. - Root, along with fruits and seeds, used as abortifacient, as well as remedy for urethral discharges. - In Batavia, vine used as anthelmintic, purgative, and emetic. - In Jamaica, leaf decoction or infusion is taken for colds, as laxative and blood cleanser. Warm tea infusions also used for toothaches and mouth infections. Also used as a bath/wash for skin eruptions and acne. Used for eczema, malarial, gout, jaundice, abdominal pain, kidney (stone), leprosy, leucorrhea, piles, pneumonia, psoriasis, rheumatism, fever and scabies. Also, boiled leaves and decoction of plant used to promote lochia. - In Antilles, sweetened decoction of leaves used as emmenagogue and vermifuge. - In Cuba, used for diabetes mellitus; used for wounds refractive to other treatments, for skin disease, and for sterility in women. - In Puerto Rico, used for diabetes. - In Indo-China, fruit macerated in salted water used for fluxes, catarrh, and children's coughs. Seeds employed in the treatment of dysentery. - In Brazil, seeds used as anthelmintic. In China, used as hypoglycemic and antidiabetic. In Turkey, used for healing of cutaneous lesions and peptic ulcers. - Seeds with oil, employed as cosmetic. - Leaves used to clean metals. A Philippine herb that has recently gained international recognition for its possible benefits in the treatment of diabetes mellitus. Despite its bitter taste, it has also become a popular nutritional drink for a boost of vim and vigor. In fact, the more bitter, the better, as it is believed that the bitterness is proportionate to its potency. Studies have suggested that ampalaya contains a hypoglycemic polypeptide, a plant insulin responsible for its blood sugar lowering effect. Other benefits suggested were body detoxification (including removal of nicotine), strengthening of the immune system and fertility regulation. It is increasingly recommended as an adjunct or supplement to traditional therapeutic regimens for diabetes mellitus. Steam ampalaya tops (upper four leaves) and eat half a cup twice daily. As a decoction, boil six tablespoons of finely chopped leaves in two glasses of water over low fire (for 15 minutes). Drink 1/3 cup, three times a day, 30 minutes before meals. Don't use aluminum pots (clay or enamel only). • Antidiabetic / Glucose Lowering: A water soluble extract of the fruit significantly reduced blood glucose concentrations in diabetic and after force-feeding in rats. Fried karela fruits consumed as daily dietary supplement produced a small but significant improvement in glucose tolerance. • Antidiabetic: An aqueous powder extract of the fresh unripe whole fruit reduced fasting glucose by 48% comparable to glibenclamide, a known synthetic drug. Testing showed no nephrotoxicity and hepatotoxicity. As an edible vegetable, it presents a safe alternative to reducing blood glucose. • Antidiabetic: Study targeted a 1% decline in A1c with an estimated power of 88%. With the observed decline of 0.24%, the achieved power was only 11%. Study failed to make a definite conclusion on M. charantia's effectiveness. • Phytochemicals: Study of chemical constituents of unmatured fruits yielded vincine, mycose, momordicoside A and momordicoside B. • Phytochemicals / Extract-Metformin Synergism: Study yielded alkaloids, glycosides, aglycone, tannin, sterol, phenol and protein. Use of the extract for pharmacologic interactions with half doses of metformin or glibenclamide or both in combination caused a decrease in blood sugar greater than that caused by full doses in a 7-day treatment study. Results suggest a synergism activity. - Perennial vegetable market produce. - Tablet and capsule formulations in the cybermarket. Antidiabetic and adaptogenic properties of Momordica charantia extract: an experimental and clinical evaluation / SRIVASTAVA Y. (1) ; VENKATAKRISHNA-BHATT H. ; VERMA Y. ; VENKAIAH K. ; RAVAL B. H.
The effect of Momordica charantia capsule preparation on glycemic control in type 2 diabetes mellitus needs further studies / Alternative Medicine Review, Sept, 2007 by A.M. Dans, M.V. Villarruz, C.A. Jimeno / J Clin Epidemiol 2007;60:554-559. Bitter melon (Momordica charantia) extract inhibits breast cancer cell proliferation by modulating cell cycle regulatory genes and promotes apoptosis / Ray RB, Raychoudhuri A, Steele R, Nerurkar P. / Cancer Res. 2010 Mar 1;70(5):1925-31. Epub 2010 Feb 23. Momordica charantia and type 2 diabetes: from in vitro to human studies. / Habicht SD, Ludwig C, Yang RY, Krawinkel MB / Curr Diabetes Rev. 2014 Jan;10(1):48-60. Acute toxicology study of momordica charantia in Sprague Dawley rats / Muhammad Ariffaizuddin Rosselan / Thesis, 2014 / Universiti Teknologi MARA. Momordica charantia fruit juice stimulates glucose and amino acid uptakes in L6 myotubes / E. Cummings,	H.S. Hundal, H. Wackerhage, M. Hope, M. Belle, E. Adeghate and J. Singh / Molecular and Cellular Biochemistry 261: 99–104, 2004.